After a few messages back and forth in Facebook, I invited Tammy Bratcher to have lunch with me at El Cerro’s on Church Street. I was very interested in her story. Why I find Tammy a unique person to write about is because she is a 40 year-old divorcee who needs a kidney and is actively seeking a donor. “Why do you need a kidney?” I asked. Having a medical background I knew she was currently on dialysis if she was in need of a kidney transplant. “I’ve had high blood pressure since I was eleven and now, I’m in end stage renal failure. I’m on dialysis three times a week,” she answered as she reached up and subconsciously touched her shunt that protrudes from her neck. Dialysis is a procedure performed when a person’s kidneys shut down. A shunt or a port is inserted into the artery and the patient is then hooked up to a machine where their blood is filtered by literally being drained out, cleansed, and then replenished back through the shunt. The procedure is a lifesaving technique performed to remove all the uric acid, waste, and toxins in the body, otherwise, the person could die. “Did you say you’ve had six car accidents?” I asked incredulously for confirmation. “Tell me about being robbed,” I asked as I began working on my nachos supreme that I was sharing with my son. We talked about a few different things including the strong family support system she has. Tammy’s been looking for a kidney donor for seven months now and she’s not giving up hope. Her family is very supportive of her needs and does their best to help when able. “What about these car accidents?” I asked finishing the nachos and ordering some fried ice cream. Since my son likes jalapenos, I had some added to the nachos. Suffice to say I should have known better than to eat them. I had to order the fried ice cream just to cool off the jalapenos. “Well, first, I want people to know I have strong faith. I believe God has kept me here for a reason and I will get a new kidney through His mercy. I want to be a living testimony to them that God is always in control and, hopefully my story, my life, will bring people back into the faith. “Second, I want people to be aware that there is a great need for organ donations. I don’t mean just for them, I mean for others, too. It’s not hard to do, either. You can go to the DMV whenever you get your driver’s license renewed and just add ‘organ donor’ to it. “How much will all of that cost the person who is donating though?” I know cost is everyone’s concern at this point. Since meeting Tammy and hearing her story, I’ve come home, passed word around to others and asked them to pray for her to get a new kidney. I know that I have been saying daily prayers for her. I leave this story with this testimony: “Again I say to you, that if two of you agree on earth about anything that they may ask, it shall be done for them by My Father who is in heaven. For where two or three have gathered together in My name, I am there in their midst.” Matthew 18:19 & 20. 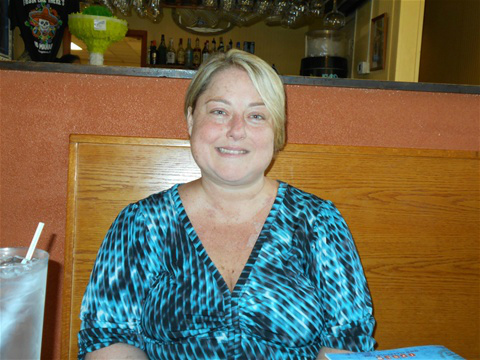 On August 10, 2015 Tammy received a new kidney. She'd wants to thank everyone for their prayers and love during this trial in her life. Welcome back, Tammy!